You thought you learned this your first clinical month in medicine. When you draw up a drug, you dispose the syringe and needle intact into a sharps container to prevent a needle stick injury. Simple, right? Now it's a lot more complicated. I previously mentioned the new rules for disposing of needles and how asinine and convoluted this is. I felt that following these prescribed procedures would lead to GREATER risk for needle stick injury. I thought these rules were dreamed up by some bureaucrat in our hospital but I have since been corrected and notified that these rules in fact come straight from JCAHO and are in affect nationwide. 1- Syringes are to be dated, timed, initialed, and labeled with drug and concentration. 2- All medications in syringes will be considered expired 24 hours after the time on the label except for propofol which will be 6 hours after the time on the label. 3- When done, syringes are to have their contents emptied into the blue/white container and the syringe thrown into that container. Needles are to be discarded into the red sharps container. 4- The correct order for drawing meds into syringes is draw the med first, then apply the label and then initial it etc. 5- Open multi-dose bottles are to be dated and initialed. 6- Open multi-dose bottles are considered expired 28 days after the date on the vial. 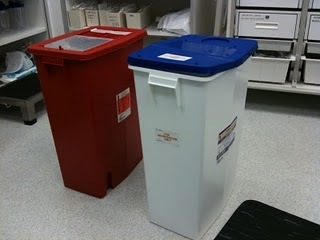 7- Open multi-dose bottles with non trace amounts of drug are discarded into the blue/white containers. The contents of the bottle do not have to be removed from the bottle prior to discarding it. The exception is any controlled substance (narcotics, versed etc.) in any container, the contents of which must be removed, fully discarded, witnessed and documented. 8- Open multi-dose bottles with trace amounts of drug may be discarded in the trash. 9- Open bottles of volatile anesthetics will be discarded in the blue/white containers. 10- IV infusion bags containing pharmaceuticals (not straight LR or NS) will be discarded into the blue/white bins and will not have to be emptied prior. What's really aggravating about JCAHO's rules is how they treat physicians like children. For instance, Rule #4 tells us exactly what order to draw up drugs and label them, as if we haven't been doing that thousands of times a year already. Or how used bottles of some drugs may go in the trash while used bottles of other drugs have to go into the blue containers. But we are warned that if we don't follow these commandments to the letter, the next time our hospital gets inspected we could lose our accreditation. I don't know when JCAHO suddenly attained a monopoly on regulating hospitals and surgery centers. They are not a government organization. Yet whenever they come around the entire hospital is thrown into convulsions trying to anticipate every potential infraction the surveyors may find. But the problem is that there is no published book to follow. When the surveyors are here they seem to make up procedures as they go along and we get written up for not following "the rules". For instance, a few years ago we were cited for not saving the empty bottles of drugs after drawing out the meds inside them. That was something new that none of us had ever heard of before. So before they left for the week word came down that we had to save all these empty bottles of propofol, succinylcholine, fentanyl, etc. on top of our carts until the case was finished. Believe me the cart table became a mess with drippy bottles of drugs everywhere, including the opened glass ampules of medications. Then about two weeks after the surveyors left, we got a mea culpa letter from JCAHO saying we no longer needed to save those bottles. So did they make up that method on a whim in the first place? If there was a published book of proper conduct wouldn't you think every hospital in the country would follow it and then there would no longer be a need for JCAHO? I would love to see hospitals, particularly the large academic hospitals, rise up and say no to JCAHO's tyranny. Call their bluff. If JCAHO does take away a hospital's accreditation and shuts down, would the sudden lack of medical access drive a popular revolt? If everybody refuses to allow JCAHO inspectors through the doors would the insurance companies and Medicare dare to refuse reimbursement for patient care? Somewhere along the line these unelected officials who meet behind closed doors dreaming up new inane rules to drive terror into the hearts of hospital administrators everywhere need to be held accountable. Otherwise we will get more and more codes of conduct like above. Next thing you know they will be telling you how to wipe yourself since obviously you can't do that properly without somebody telling you how. You can thank your local water testing agencies for this one. You may have heard in the past 18-24 months about trace amounts of drugs being detected in the water supply. The belief is that these drugs show up in water because they're dumped into sinks and toilets around the country. Advances in testing made it possible to detect minute amounts. So, even though there's no documented harm from these trace amounts ( you don't see your fellow citizens walking around with erections lasting >4 hours because of all the Viagra in the water supply, right? ), it's now considered improper to dispose of meds by flushing them. But throwing them away isn't good enough, either...might end up in a landfill and leach into the water supply. so they're treated like biohazardous waste, but separately from REAL biohazardous waste. Someone is making a fortune off this, and it's not just TJC. Thankyou for sharing the information with us.Excellent post!